The French may be the ones famed for decapitation, but it's the Italians who have got the guillotine out this time. And my oh my was it worth it; the Alfa Romeo 4C Spider is definitely one of the stars of the Detroit motor show. While the squat hard-top coupe has slightly odd proportions, appearing to be even wider than it is long, the Spider manages to shake that impression off. And the surgery needed to remove the scalp of this sports car hasn't dented its on-road prowess either. With the same tiny but muscular turbocharged 1.8-litre engine under the bonnet as the coupe – kicking out a substantial 237bhp – and just an extra 10kg to haul around post roof-loss, this is a bona-fide sports car, regardless of its added posing ability. Helping to keep the Spider trim is the liberal use of carbon fibre, which appears in the windscreen frame and underlines the whole construction of the car alongside lightweight aluminium. As a result of the punchy engine and lightweight shell, the 4C Spider can sprint to 60mph in a claimed 4.1 seconds and keep going all the way to 160mph. Another improvement over the Coupe will be the sound effects. Though the standard car is hardly under-endowed in the aural pleasure department, drivers can expect even more from the Spider – especially with the optional all-new Akrapovic dual-mode sports exhaust. 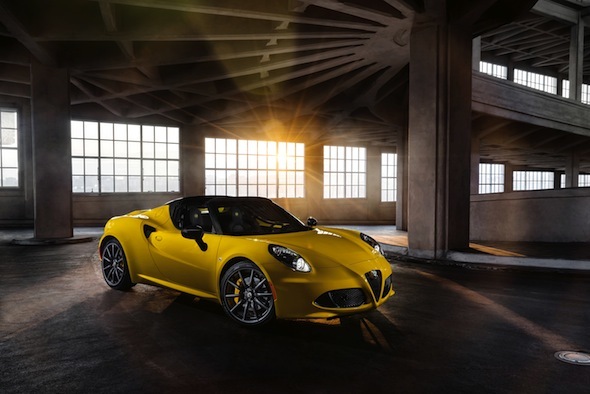 The convertible 4C also gains several new alloy wheels designs and a striking new yellow hue. This new Alfa goes on sale in Europe in the summer, with prices and specifications being released closer to the launch date.